I am a "Traje de Charro" (a Charro Suit) and I practically never speak but I'd like to take advantage of this moment to make a confession or two. My name is Spanish in origin and the word "charro" comes from the Basque word "txar", which means "peasant". I am present in many movies, on the streets, in parties, embassies and consulates. I am even in events that go from typical weddings to the Olympics and despite what my compadre, Ranchera Music or my girlfriend, Tequila, may say, I am the best representation of Mexican culture, hands down. I beg your pardon for the lack of humbleness but I know my physique is elegant and of unbridled beauty from head to toe. My broad-brimmed hat made out of felt, leather or palm leaf trimmed with bright ribbon is sometimes decorated with embroidery, leather appliques or bone. My shirt, white or otherwise, can be seen with a close-fitting collar or with the collar turned up. My jacket is made out of suede or material that is sometimes adorned with silver or bone buttons. The same goes for my pants or my skirt (for those ladies who wish to embellish themselves with me). I always have a bow tie or a fancy neckerchief that matches with the rest of the outfit or that stands out creating a spectacular contrast in color or design. I am complemented by boots and a leather belt. Even though the beautiful cloth "sarape" is an important part of my body, I don't show it all that often. It is seen only in elegant parties, in times of cold weather or on those who don't do daring stunts, as it could get in the way. Many times, I am worn with a revolver and in other occasions, a lasso, which can form an important part of my look and which I show when I perform lasso stunts. In my youth, I was only a pair of pants and a plain white cotton shirt, with "huaraches" (leather sandals) and a straw hat. I was worn by ranchers and musicians in colonial times and in those days, fine textiles and buttons were exclusive to landowners who had come from Salamanca, Spain. In fact, the traditional suit of Salamanca is my true father. It is he who gave me my name even though we don't look at all alike, save for the basic traits. The same happened with my brothers: the "Traje Gaucho" from Argentina, the "Traje Llanero" from Venezuela, the "Traje de Chalan" from Peru and the "Traje Huaso" from Chile. We share the same origin even though we are completely different. That's what happens when we mature and develop our own personality. My adolescence arrived in the 17th century, when Mexican law allowed ranchers and horsemen to use textiles and adornments that the Spaniards used. It was then that my body began to adapt, like any normal adolescent. First came the button-down chaps that appeared on my legs and then a long, leather vest called "tapabalazos" (bullet cover), to protect the chest and legs from an accidental shot while riding horseback. My first official appearance as a serious type of clothing was before the high society of the 19th century when Maximilian of Habsburg, the only emperor that Mexico has ever had, wore me with poise. Made of fine black fabric and silver buttons, he wore me in every public event he could attend. Since then, my elegant figure has not changed much though I always adapt to the occasion. Sometimes, I'm in the mood for competition and I need to be light but protective for events like "charreria" (the art of Mexican horseback riding and lassoing). In other occasions, I am elegant and come in only one color, normally black or white, from head to toe. I do have to point out that in many cases, I do like the attention and love to shine onstage with sparkling adornments, bright colors and eye-catching combinations. As a good Mexican, I served in the military during World War II when the then president of Mexico, Manuel Avila Camacho named the "Charros" (Mexican cowboys) as the first line of defense of the army. For this reason, I am normally only adorned by a revolver, which I always carry. It was in the 20th century, during the 30s, that the orchestra conductor, Miguel Lerdo de Tejada declared me as the official uniform of his orchestra. Because of this visual impact, the Mariachi also adopted me as their official garb to this day. 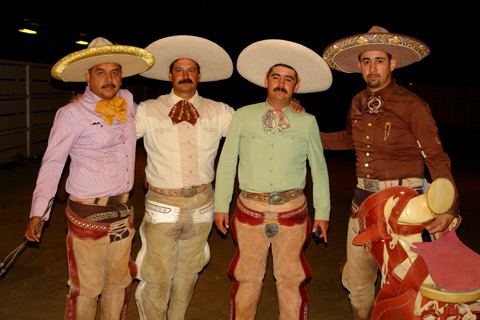 Nowadays, my presence is academically regulated by the Mexican Federation of Charreria and by the National Association of Charros, who strongly criticize Mariachis and artists who use new colors, designs and accessories for their shows. I have to confess that, thanks to these shows, movies in which I've taken part in and the important figures that I've clothed, I have become well known in almost the entire planet. For this, I will forever thank the modern yet daring use that has been given to me. I have adapted and outlived old traditions, keeping myself always fresh and attractive in the eyes of the world. This doesn't mean, however, that I am either a costume or even a folkloric clown suit. I am simply what the Mexican people allow me to be: a dignified representation of the culture. I am very pleased and it is an honor to be worn more and more by people who want to be seen in my handsome attire. I can be found in various specialized shops in the state of Jalisco, in Mexico City and in almost all the states of Mexico, in places where they sell traditional garb in every region. You will never find me in a department store. Colorful versions of my hat, however, are always available in the markets and in certain handicraft shops, a worthy memento of Mexico that many tourists take home with them, sharing my presence in places where I am simply known, with much honor, as the Mexican suit.